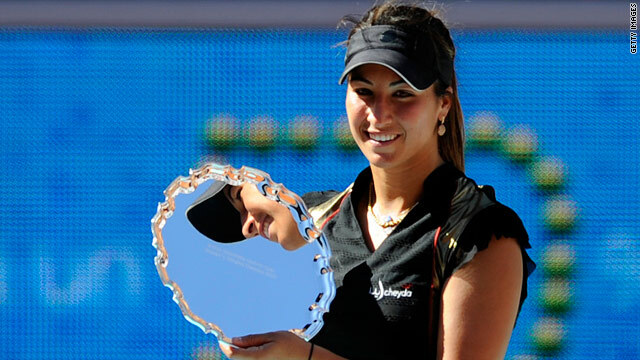 Rezai proudly displays her trophy after stunning Venus Williams in the final of the Madrid Open. (CNN) -- Unseeded Frenchwoman Aravane Rezai produced one of the shocks of the year on Sunday by defeating favorite Venus Williams in straight sets to win the final of the Madrid Open. The 23-year-old Rezai -- who had only claimed WTA Tour titles at Strasbourg and Bali prior to Madrid -- continued her remarkable week with a 6-2 7-5 victory, adding Williams' scalp to her earlier surprise victories over former world number one's Junstine Henin and Jelena Jankovic. Williams, who returns to No.2 in the world behind younger sister Serena on Monday, lost the opening set in just 27 minutes and then failed to take advantage of a 4-1 lead in the second set. "I just cannot believe this," world number 24 Rezai -- who must now enter calculations for the French Open -- told reporters. "Venus played very well and I've always respected her as a player and a champion. I just tried my best today and it worked well for me." Williams, who was looking to secure her 44th career title, only converted two of her 13 break points in the match -- a statistic that contributed greatly to her defeat.